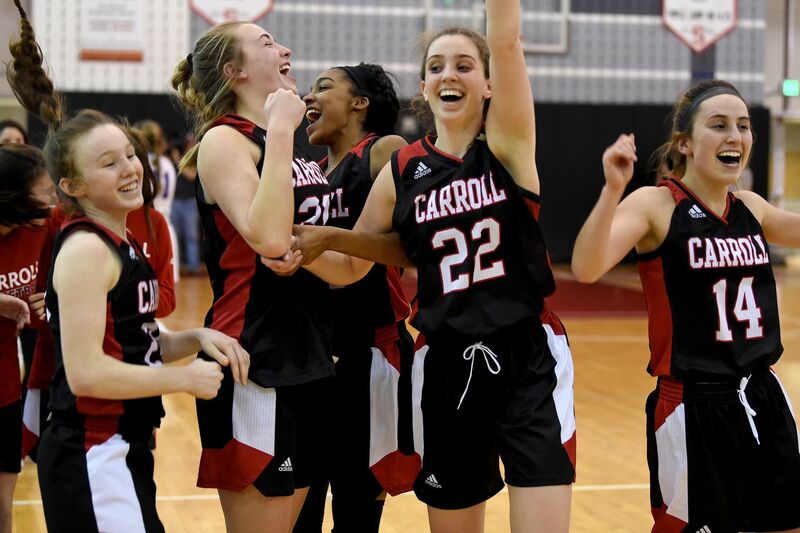 Archbishop Carroll's starters celebrate as they win in overtime, defeating Southern Lehigh 39-32 in the PIAA Class 5A Girls semifinal at Souderton High School March 19, 2019. Archbishop Carroll girls’ basketball coach Renie Shields never wants to go into overtime. The goal is to always close out a victory in regulation. But the Patriots, like they have done all season, persevered to beat Southern Lehigh, 39-32, in overtime in the semifinals of the PIAA Class 5A playoffs at Souderton High on Tuesday. Next up for Archbishop Carroll is Chartiers Valley, which beat Thomas Jefferson to advance to the championship at the Giant Center in Hershey on Saturday. Archbishop Carroll’s defense helped the Patriots prevail over the Spartans in overtime. While the Patriots’ offense couldn’t get into rhythm because of a stingy Southern Lehigh defense, they were able to get to the foul line in the waning seconds of overtime to take command. Patriots senior guard Harlem Jennings and junior forward Erin Sweeney made two steals with less than a minute left in overtime, which led to five free throws that proved to be the difference in the victory. Sweeney finished with 14 points, including four in overtime. Freshman guard Grace O’Neill scored 11 points and senior guard Mary DeSimone had nine. Southern Lehigh guard Olivia Snyder, who scored 20 points, gave the Patriots problems all night, but their defense was clutch late in the game. A lot can change in one season. At this point last season, the Patriots had just been knocked out of the semifinals by Mars High, a school in the Pittsburgh area. Sweeney said it was a goal all season to get back to the semifinals, and eventually win the title. And DeSimone thinks the Patriots have one more thriller left in them. “I definitely think we do,” she said. AC: Erin Sweeney 14, Grace O’Neill 11, Mary DeSimone 9, Harlem Jennings 2, Karli Dougherty 1.